Seattle Washington's C.... We traveled through Washington and Oregon area in mid June just before the summer crowds started showing up. You can see by our coats and hat that the temperatures were cool even in the month of June. 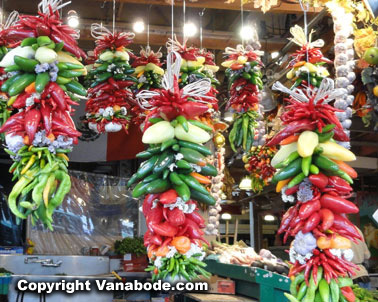 And no matter if we were in Port Townsend or Shi Shi Beach the wind was constant.. Getting around the Olympic Peninsula, dining and dealing with lodging was easy as pie because of our Vanabode lifestyle. See where we stayed on the shores of the Straight of Juan de Fuca. Seattle's historic district is called Pioneer Square. Here you will see the oldest to the newest. The newest being the sports stadiums for the Seahawks and the Mariners. The old being that Pioneer Square is the oldest neighborhood, since the mid 1800s. You can take an underground tour which starts at the Pioneer Building to see some of the old Seattle before the fire of 1889 and the rebuild. Horse drawn carriages and cobblestone streets can be enjoyed. The popular thing to do during the day in Pioneer Square is to shop the antique shops, art galleries and classic bookstores. However, at night this place is all about live music, dancing and nightclubs. Pioneer Place Park is at the corner of 1st Ave. and James St. 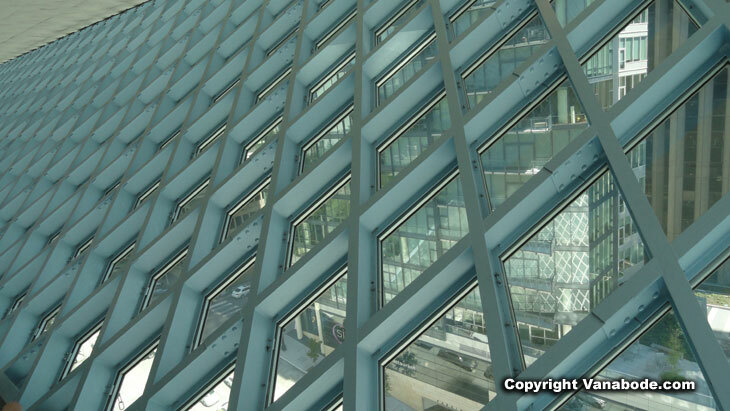 Above: This picture was taken from the top floor of the very impressive Seattle Public Library. We walked around for a couple of hours trying to take in this enormous library. Note to self, need two days at library. The library was officially established in 1890 and the current 11-story steel and glass building opened in 2004. It has been voted as one of 150 favorite structures in the U.S. by the American Institute of Architects. Not only will you find this 363,000 square foot structure striking in appearance the interior is even more spectacular. However, if you aren't fond of the modern design you still have to love the genius Book Spiral. You know how our traditional libraries categorize books by the Dewey Decimal System in rows or even on different floors. Well this fabulous spiral design keeps the numbers flowing round and round continuously up four floors. No escalator, elevator or stairs involved if you don't want. 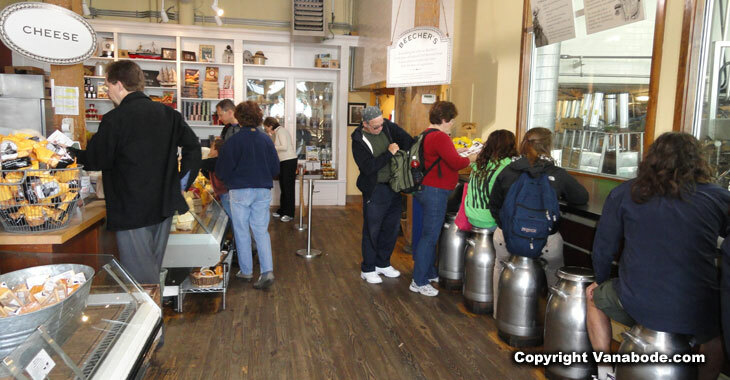 Above: Picture of Beecher's Handmade Cheese shop located at Pike Place Public Market. Beecher's is part of the Sugar Mountain family which includes Maximus Minimus food truck as well. Yes, we ate here for sure, couldn't pass it up. We had a delicious soup and with some bread and their cheese curds. This is an exciting place for lunch. You can watch them make cheese and look into the cooler at their aging cheeses. Check out those milk canisters as stools; maybe not the most comfortable but definitely fun. 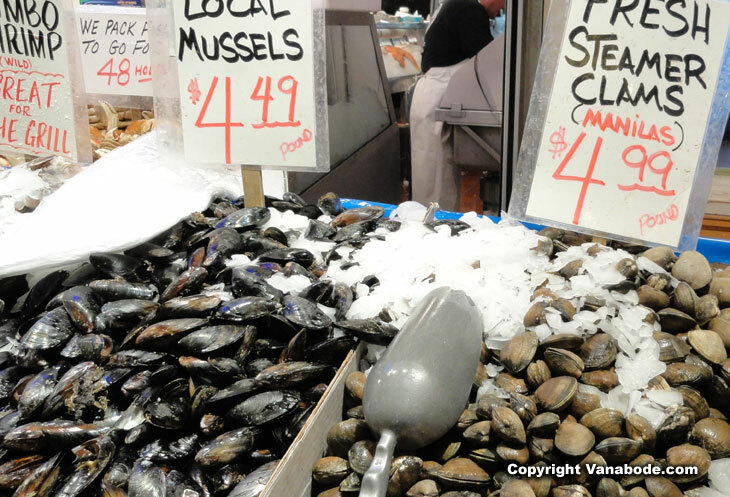 Above: Picture of shellfish for sale in the Public Market. Of course buying mussels and clams that have already been fished for you is the easiest way to go, but I just might have one better. In the states of Washington and Oregon you can get a shellfish license that allows you to collect your own clams, mussels, oysters and more from their beaches. Oregon beaches at low tide with people shellfishing. Above: Now if this isn't confusing when giving out directions. 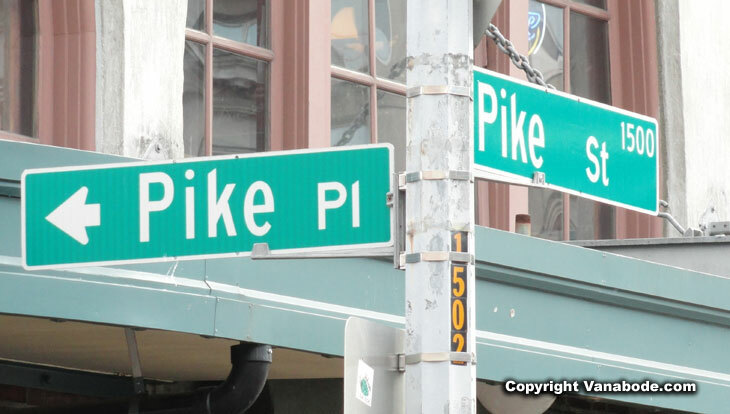 Can't get enough of The Pike, I guess. The picture of this sign was taken at the Public Market Center. There really are too many things to look at in Seattle and too many things you will probably miss. My suggestion is take pictures of everything you see even if this takes you out of your comfort zone. You might feel stupid and maybe embarrassed but pictures are memories and many are priceless. There's no way you can remember every detail or adventure of your Florida vacation or even your wine trip on your California vacation if you don't take a gazillion pictures. 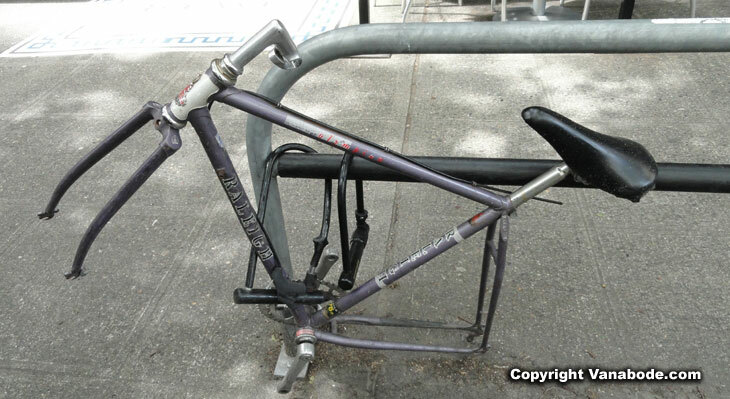 Above: Picture of bike frame still locked up to bike rack. I'd like to know when all this dismantling took place. Was it in one day or over time? 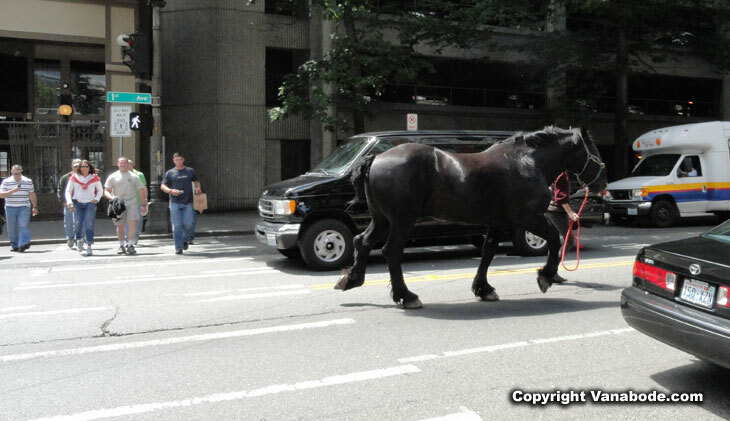 Above: Picture of a horse walking on a street in downtown Seattle. Where is the carriage? The slower pace of the horse drawn carriage is a pleasing feeling. Sitting back, relaxing, enjoying the sites of the city with the hollow clop clop of the horses hoofs just might change your view of our fast paced world. Where are we going so quickly? The large horses that pull the 1,000 pound carriages are work horses with gentlie temperaments and they have been trained for months before taking to the busy city streets. 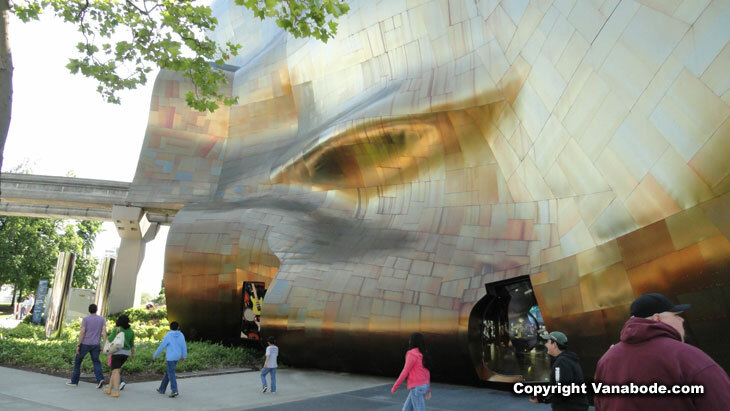 Above: Picture of Science Fiction Museum on the campus of the Seattle Center. Collected artifacts included Star Trek's command chair where Captain Kirk sat, Lost in Space robot B9, the T800 Terminator, and the a model of Star War's Death Star. The Space Needle is just a few short steps away. The Seattle Center Monorail runs through the building. And although the Science Fiction Museum was closed in March 2011 the building itself is quite spectacular. 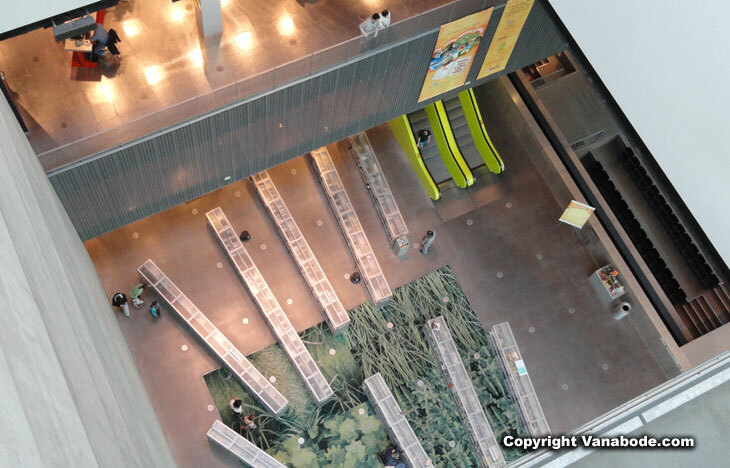 Above: Picture taken from inside the public library looking to the street below. If you like the modern design or not you have to love the fact that this almost 363,000 square foot building houses more than 1.5 million books and other library materials. It is located Fourth and Fifth Avenues.